It continues to be an exciting time at Huber Engineered Materials, as we’re pleased to launch another innovative product, ReCal™ Platinum Calcium Carbonate. ReCal is 50% post-consumer content (third-party verified) and 50% post-industrial content (third-party verification pending) milled to a consistent median particle size and topcut. Huber’s ReCal Platinum Calcium Carbonate offers recycled content for those applications which demand it. Application possibilities include as a component in a variety of building materials used for various green building credits, including the LEED® Program and National Green Building Standard™ Rating System. We invite you to learn more by clicking here to download our Technical Bulletin which contains what you need to know about this exciting technology! 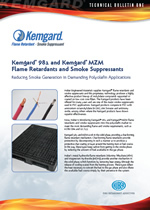 We’re pleased to introduce a new Technical Bulletin with comprehensive information about two high-performing Kemgard® flame retardants and smoke suppressants available for the most demanding Polyolefin applications: Kemgard® 981 and Kemgard® MZM. Click here or on the image at right of the Technical Bulletin to download it. For more information on the Kemgard brand, click: www.kemgard.com.